This coming Monday is The 4Th of July the USA Independence day. It is also a birthday of a young friend of mine Mr Asrul. Who also like to do blog for his own feeling and thought about himself and his beloved country of Kedah. Best wishes for him and good luck for the future.Why I write this article? Perhaps I just want to commemorate the independence of the USA or I want to share it as an example for other country such as Malaysia. The USA win their Independence with blood, sweat and tears and as for Malaysia it also share the same experience from it. A country with an idealistic and philosophy contribute a great nation and the number one is the privilege of the people living inside the country. Malaya or Tanah Melayu already enjoying the Independence since 1957 and Sabah in 1963 from the British. The government of Malaysia is trying their very best to keep it as long as it can be. Vast development had been enjoyed by the people of Malaysia. Compare with the USA, we are far behind form Education, Politic and so forth but bear in mind that we are following closely behind. From the development of America Constitution in 1776, it hard to build a good nation and the situation is different with different leader. Cannot be imaginable the country has stand long enough as a great nation. Although we know that America is the develop and stronger-est country in world who is willing to sacrifice the blood of an American sometime act un rationally but please look from a different perspective, we need a country like that who willing to help the poorest country in the world. Salute to the American. It should taken as an example for a young nation like Malaysia and other country in South East Asia. Good Luck and Happy Independence Day 2011. History Of The Independence Of America. Independence Day, commonly known as the Fourth of July, is a federal holiday in the United States commemorating the adoption of the Declaration of Independence on July 4, 1776, declaring independence from the Kingdom of Great Britain. 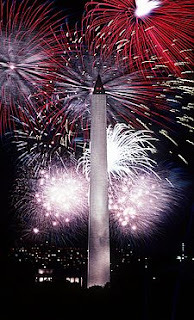 Independence Day is commonly associated with fireworks, parades, barbecues, carnivals, fairs, picnics, concerts, baseball games, family reunions, political speeches and ceremonies, in addition to various other public and private events celebrating the history, government, and traditions of the United States. Independence Day is the national day of the United States. In a remarkable coincidence, both John Adams and Thomas Jefferson, the only signers of the Declaration of Independence later to serve as Presidents of the United States, died on the same day: July 4, 1826, which was the 50th anniversary of the Declaration. Although not a signer of the Declaration of Independence, James Monroe, the Fifth President of the United States, died on July 4, 1831. Calvin Coolidge, the Thirtieth President, was born on July 4, 1872, and thus was the only President to be born on Independence Day.